Today is March 30. Yes it is. Today is the day I set to finish my delayed 7 Small Shawls Y4 eBook. I dreamed a dream of completion, but I failed. I hoped to miraculously pull it out at the last minute, but the stars did not align, and I was not able to make those stars care one way or the other about how I was feeling about it. I do have a wee update, however. There are three shawls in the app process and when Apple approves them, they will go live as both app and pdf. The fourth and last shawl is in the process of being (possibly) resized for an additional yarn choice before it is ready for you. And then there is an extra fun bonus shawl (because I think you will love it!) that's a variation on one of the other shawls coming this time. If you are on Instagram (I'm RomiDesigns; come by and say hello! ), you will be able to watch as things take shape. And yes. I will even come over here and post pictures. I've been MIA too long. I failed to make the due date, but I did succeed somewhere else. I have truly begun to enjoy what I do again, and for some time, I thought I had well and truly lost that. The reason I am late this time is that the remaining projects in the eBook had to be great. I could have whipped up a bunch of mediocrity, but I decided to go for the gusto, and it is the best thing I could have done for myself (and I hope for you, too). With my rediscovered joy has come a flood of returning creativity, and it all started with my absolutely having to do a sweater for you all as a bonus pattern. It would have been faster to do a hat, but you know? I needed to give you all something special that everyone could wear and love. So Village Sweater Wrap was born from 4 skeins of A Verb for Keeping Warm Even Tinier Annapurna. I do so hope you are enjoying it! I am very sorry to all of you who are disappointed, but the patterns will be coming soon, and they are great patterns. I couldn't do less and still live with myself. So...instead of all the patterns today, here are some sneak peeks! There's lacy wavy asymmetry, done in Shalimar Breathless or Huckleberry Knits Cascara Silk. This one can be enlarged, as it is based on wedges. I'm kind of geeking out about how the waves line up in the chart. It reminds me of waves breaking on shore. There's two color asymmetry with stripes and lace (in two sizes!) done in Miss Babs Yummy 2-ply or Dubai Knits Faith, Hope and Love. This was so much fun to design and knit! It was totally play time for me. I hope you love it as much as I do! And there's a lace edging with a crescent shaped garter top in Yarn Sisters Black Pearl or The Yankee Dyer's Yankee Sole II. I so love the way this turned out: simple but lovely. Believe it or not, until more recently than I care to divulge, I couldn't harness my brain to work out the edging on this one, even though it was all designed in my head and I had charted it (imperfectly, to say the least). It's a modification of the Sunspot pattern (from the Barbara Walker stitch dictionaries) that turns it into a knitted on edging. I kept staring at the chart and not really seeing it. This is the pattern that will have a two color bonus variation coming up just for the fun of it! That, and the fact that I love this lace pattern. It's another one I am totally geeking out on. And for the fourth pattern? Here's a wee sneak peek of the unfinished item from Instagram. I could not just rush through this one. It needs to be perfect, Malabrigo Finito is one of my very favorite yarns, and it deserves to be born as a prominent part of this collection. I am squeeing every time I pick it up. Look at the center cable! It's got an eyelet in the middle. And there will be a 2nd yarn choice: Road to China Light! I know you will all love this one! So...please bear with me to wait a little bit longer for fabulousness, even though it is late fabulousness. Romi, We have waited this long, we can wait a little longer. Plus, I am swatching for the Village Sweater wrap, so I am fully occupied! Good things come to those who wait. And these are so good! Romi, your efforts are apparent in each amazing design you create. I know I am among many who await your next and every creation with patience and great anticipation of yet another adventure working with our sticks and string. Thank you! So, so, so glad you've rediscovered the joy in designing! We will all be so much happier with the results (and, OMGosh, the sneak peeks are wonderful)! I love the looks of that 4th shawl, I can't wait to see where you go with it. 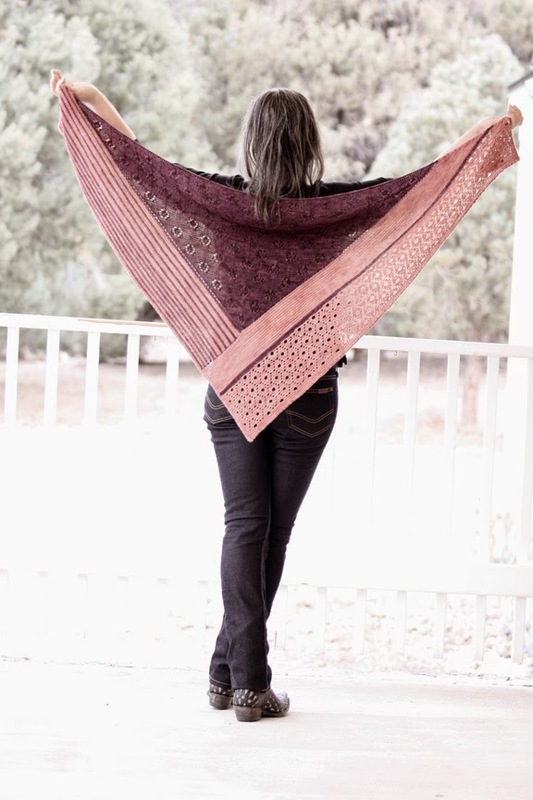 My humble heart swells with pride - my yarns in a Romi Hill shawl design! Wheee! Than kyou for this honour, Romi. Can't wait to shout it to the world. Romi, your designs are worth waiting for. We have all benn through low points when we felt our creativity and motivation fade from view. Thank you for sharing your struggle. The projects look incredible. While it's true that you had made a time commitment for the Year 4 patterns, I would hope that most people would be a bit flexible and understanding. Sometimes - things happen! If anyone doesn't have enough of your patterns to knit, they could use the freebie coupons you generously sent us to buy some of your older patterns to pass the time. There are some beauties from the past that I'd love to knit, but I'm having a hard time keeping up with all that you have recently published! Keep up the great work - I count on your fantastic sense of color and style and will wait until you're happy with the patterns to publish the rest of the Year 4 shawls. I can't wait to see more of that last shawl! Love the cable down the center! I so understand finding one's joy in knitting going through a waning phase. It's almost scary to me, maybe because I'm afraid it won't return. But I've learned it does, I've read that it returns to others, and now the joy has returned to you. Maybe we just need to turn our creative tendencies elsewhere for a while until the knitting mojo returns. Don't pressure yourself and don't rush to finish the patterns. We can wait; and now that we have an idea of the wonderful designs coming, we can plan the yarns. Enjoy the spring! these new shawls are all beautiful and so worth waiting for. I have have so many of your designs on my list and not enough time, or maybe I can learn to knit faster! Enjoy your journey and we will knit them when you have them designed as our part of the journey continues.